Date/Time - 17 Mar (Friday), 8 p.m. 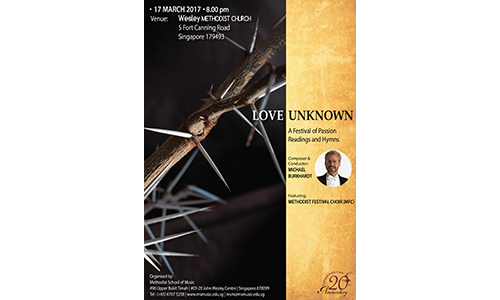 This Festival of Passion Readings and Hymns features the Methodist Festival Choir with guest conductor Dr Michael Burkhardt. Hymns from a variety of traditions (including chants, 20th century American, and African-American, among others) are brought together as a means for God’s people to journey with Jesus, from His triumphal entry into Jerusalem to His death on Calvary’s cross. The readings preceding the hymn settings are taken from The Final Week of Jesus by Max Lucado; together, they allow us to experience ‘Love Unknown’ anew. Organised by the Methodist School of Music. Free admission.